Chicken thighs are deliciously moist and tender and even more appetizing when cooked with these flavourful ingredients. Preheat the oven to 180°C/gas mark 4. 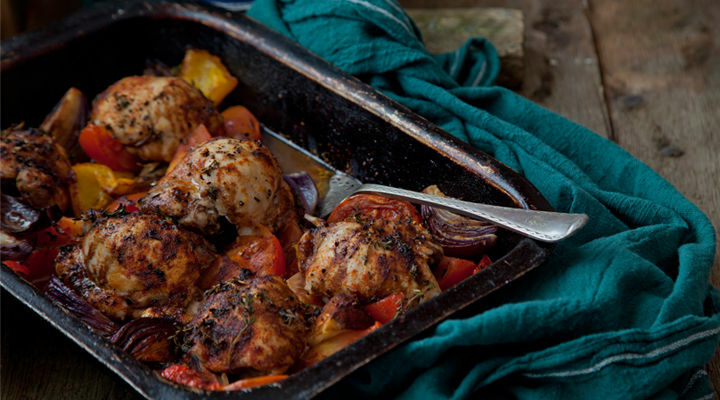 Place the chicken thighs, tomatoes, onions and peppers in a large baking dish or roasting tin (roughly 25cm x 30cm). Squash the unpeeled garlic cloves with the back of your knife and add to the tray too, then scatter over the thyme leaves and sprinkle over the paprika. Add the oil, balsamic vinegar and a good pinch of salt and pepper. Toss everything together really well to coat, then spread across the tray in a single layer, making sure the chicken isn’t covered by the vegetables. Roast in the oven for about 1 hour, until the chicken is golden and cooked through, turning and basting it a couple of times while it cooks with the juices from the tray.